Do you need to send offer for the goods, announcement about updates or changes? 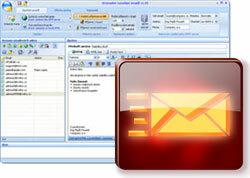 Do you need to send message to several e-mail addresses? Do you want so as every recipient not to see addresses of other recipients? Don´t you want to rely on only insertion of recipients list in copy (hidden)? Program SendMail is able to do still jolly sight more! Get free registration codes for licence HOME Free. It is easy, only fill in the following form.